Santander, one of Britainu2019s biggest banks, has been forced to amend the rules of a photography competition after a shareholder complained they left entrants open to exploitation. Santander, one of Britain?s biggest banks, has been forced to amend the rules of a photography competition after a shareholder complained they left entrants open to exploitation. 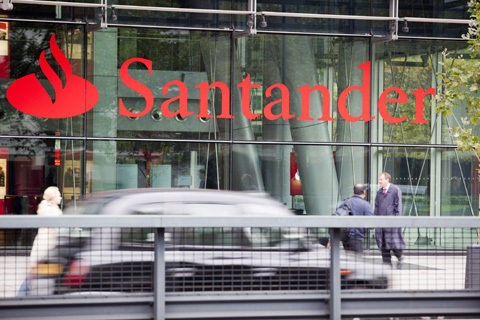 Open to Santander?s 1.8m UK shareholders, the 2010 ArtShare Photo Competition invites them to enter pictures that reflect their views on the city in which they live. Entrants were also asked to explain how their picture represents the strength and ?healthy spirit? of their city, to reflect Santander?s ?corporate values?. The Spanish banking giant ? 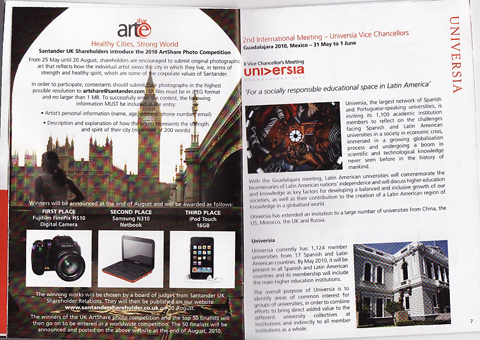 which took over Abbey National in 2004 – publicised the contest in its Focus Magazine (pictured below) and offered prizes include a Fujifilm FinePix camera, a Samsung laptop computer and an Apple iPod Touch. But the conditions of entry gave the Madrid-based organisers the right to exploit submissions for commercial use. And Santander did not make clear whether the participant would retain copyright to their photo which is a photographer?s basic right. The rules state: ?Upon submission the artist will give the right to Santander to publish the photographs in any of its shareholder publications? ?The final winners authorise Santander to use their names and likenesses for informational and publicity purposes and also give Santander exclusive usage rights to all of the text images and material produced for participation in this contest.? The terms left amateur photographer Peter Rust, a Santander shareholder, bemused. He felt the rules were unfair and refused to enter until Santander clarified its position over copyright. In an email to organisers, dated 26 May, Rust complained that the contest failed to state whether entrants retain the rights over their image. When he did not receive a reply, he turned to Amateur Photographer (AP). It seems AP?s intervention may have paid dividends. Organisers last night confirmed that entrants will retain copyright in the photos they submit. And the rules now contain a paragraph stating: ?Images received will not be used for commercial use without the consent of the contestant responsible for the image.? Andy Smith, Santander UK?s head of media relations, told AP?s newsdesk: ?The t&c?s [terms and conditions] have been amended? Thanks to you and your readers for pointing this issue out to us. ?